Brighton Shell Pit Digging up Profit | Seminole Tribe of Florida, Inc.
BRIGHTON — A steady procession of dump trucks has traveled in and out of the Brighton Reservation shell pit thanks to an abundance of work from multiple sources, including the Army Corps of Engineers and the South Florida Water Management District (SFWMD). The Army Corps and the SFWMD are using the shell pit fill to rebuild the 1930s-era levy around Lake Okeechobee. The Brighton pit also provides material for private companies, area counties (including Glades, Okeechobee and Highlands) and the reservation. In addition to road work and buildings under construction, projects underway in Brighton include land improvements, culverts, ditches and pasture improvements for cattle owners. The 125-acre site opened in the late 1960s. The Tribe utilized the land as a fish, turtle and gator farm before turning into a mining operation about 15 years ago. The Board took over the venture in 2011 and now makes a profit, Platt said. Like oversized toys, earthmoving excavators dig in, take huge bites out of the ground and release it into massive haul trucks. A machine called the Powerscreen Titan 1800 then sorts the raw earth. All material from the pit complies with state regulations and is certified by the Florida Department of Transportation (FDOT). 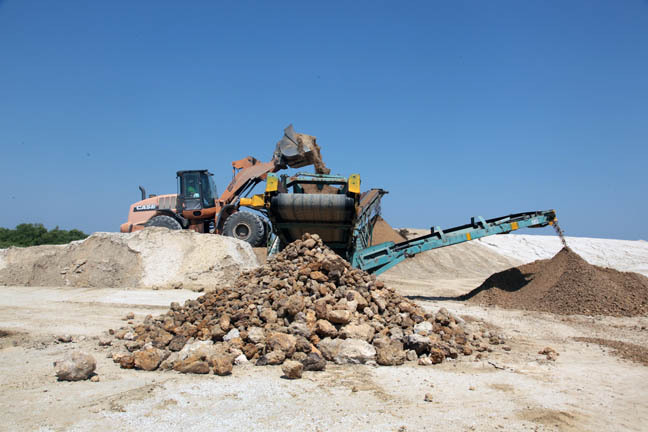 Products from the shell pit include limestone or cobblestone, FDOT-certified large pebbles and fine-screened shell, or rough sand. The Brighton pit is the only one in the area with FDOT-approved shell for road bases, so towns including Lake Placid, Sebring, Avon Park, Clewiston and Moore Haven are customers. Recent upgrades on State Roads 70 and 78 were completed with Seminole fill. Each heavily laden truck represents income for this Board operation. On one recent day, 337 trucks from several companies filled up. Typically, around nine or 10 trucks from about three or four companies pass through the check-out scales. Through the weigh station window, Melissa Gopher tracks every load that leaves. The shell pit will run out of fill in three to five years, at which point Rep. Howard envisions the land used as a recreation area. Because the pits are only 8 feet deep, they can be turned into lakes for swimming, boating and jet skiing. Platt said they will look for other land on the reservation to continue the mining operation in Brighton.